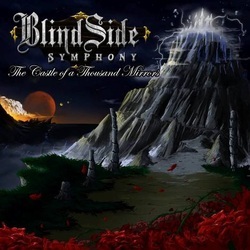 After releasing a full length debut CD in 2012 as well as a follow up EP, BlindSide Symphony returned in 2013 with the Valley Of Destiny single, which proved to be a foreshadowing of the album that was forthcoming. The Castle Of A Thousand Mirrors shows some definite leaps forward in both the maturity of the music as well as the production of the music in general. Throw in some incredible artwork on top and we have a pretty slick package. Musically, the music is very epic and sweeping symphonic power metal that would sound right at home with any of their European counterparts, though these hardworking and talented musicians are from Argentina, where metal is not known to be a stronghold. What really impresses me is the finesse in the guitars of Gonzalo Mayo, which sound very solid and work very nicely with Emilio Fernandez' vocal work. In fact Emilio's vocals are even more smooth and refined than they were on the previous full length. I must also make a mention of the mixing of the CD before I get into the particular songs on the CD. The flow from one track to another is well done. If you take the entire album as one element, it paints a rich tapestry of sounds that elicit a good visual while you go through the complete album. They also still stick out on their own accord. Some tracks do stand out a bit more than others, but that is pretty normal. Some of the highlights on the album include the lead single Valley Of Destiny, Riding On Dreams, the very folksy feeling Where Heroes Sleep and Anatomy Of Chaos, but there are several others as well. I think my biggest detraction for this CD is one of personal taste. The title track is about thirteen minutes long and I am not a fan of the really long epics as my attention span can rarely take them in, but I understand that they are a big part of the genre of music so I am not going to dwell on that. When I wrote the review for The Journey, I said that the band was lacking in two things...production and confidence and I can safely say that both have been improved greatly since the debut and the band are moving in the right direction as this CD is a step up in all avenues!